To compress the response you can use classes from System.IO.Compression namespace. Especially GZipStream and DeflateStream classes come handy when it comes to compressing the response. So, let's write a simple custom action filter that does this job. The above code creates GZipOrDeflateAttribute class that inherits from ActionFilterAttribute base class. It then overrides OnActionExecuting() method of the base class. Inside, we retrieve the value of Accept-Encoding HTTP header. This header is sent by the browser along with the request. This header indicates the encoding types that the browser can understand. For example, on Chrome this header is gzip, deflate, sdch. We then check the value of this header. If Accept-Encoding contains gzip it indicates that GZip compression is supported. We then append Content-Encoding HTTP header to the response and set its value to gzip. The Filter property of the Response is set to an instance of GZipStream class. Notice that while creating the GZipStream object we pass the original filter stream and compression mode of Compress to its constructor. If gzip is not supported then we check whether deflate is supported. Accordingly we set Content-Encoding to deflate and create an object of DeflateStream class to assign to the Filter property. 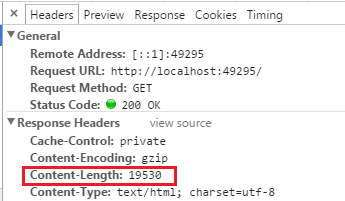 To check the response content size before and after the compression you can use browser's developer tools. 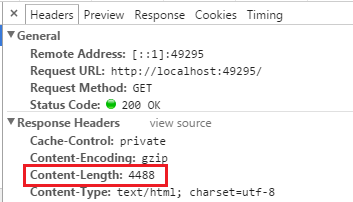 For example, the following figure shows that the response content length for a test view without any compression. As you can see there is reduction in the size of the response content. If you wish to apply minification to your HTML response then you may also have a look at these NuGet packages - WebMarkupMin and Meleze.Web.